Concessions made for cyclists by the City of Vancouver has been hotly-contested over the past several years, and it seems that the debate is shifting to the Comox Valley. 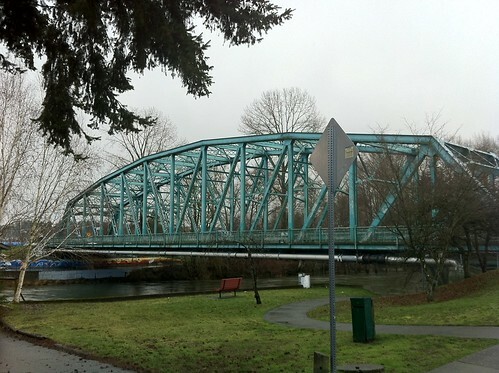 The 5th Street Bridge is one of only two crossings over the Puntledge River in downtown Courtenay and local cyclists are pushing for a connection that’s both pedestrian and bicycle-friendly. As it stands today, the 5th Street Bridge is narrow, boasting only two lanes for vehicle traffic with awkward sidewalks on either side of the bridge. 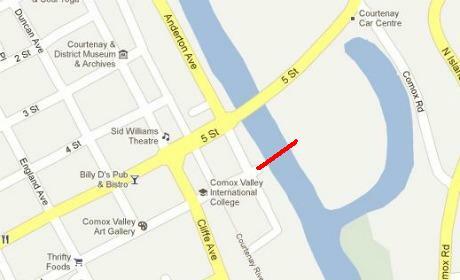 Recently the Comox Valley Cycling Coalition (CVCC) approached Courtenay City Council and presented the idea of a bridge from the foot of Sixth Street, across the river to Simms Millennium Park (as illustrated below). A safe crossing for cyclists and pedestrians – both of which frequently use Simms Millennium Park and the adjacent Lewis Park – is crucial for the expansion of sustainable transport in the Comox Valley. Courtenay City Council hasn’t commented on when a decision will be made. What are your thoughts? Is a pedestrian and bicycle-friendly bridge crucial in the Comox Valley? Of course a bike and ped-friendly bridge is necessary, as part of an overall transportation plan that includes cyclists and pedestrians. I used to cycle in the Comox Valley when I lived there several years ago, but with the traffic increases, I would never cycle there now. Remember, all of you operators of cars (and I’m one, too), the more cyclists that can safely travel the roads, the less air pollution, noise and congestion you will have to deal with. Cycling benefits everyone – whether you are on a bike or not. I object to cyclist and pedestrians being lumped together. Cyclists are not little babies riding kids toys. Cyclist are vehicles under the motor vehicle act and need to ‘take the lane’ whenever they feel the need. The road is for cars and bikes, pedestrians can remain on the sidewalk. Its not hard – cyclists need to own their share of the road when in use, wear reflective stuff and signal clearly. Motorists will slow down and respects the cyclists as they have no choice, it is a shared thoroughfare in this way same as with motorcycles.